So"journ*ing\, n. To dwell for a time; to live in a place as a temporary resident or as a stranger, not considering the place as a permanent habitation. 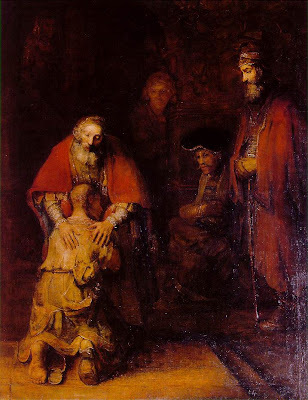 I'm enjoying reading two books about the Prodigal Son: Tim Keller's - "The Prodigal God" and Henri Nouwen's - "The Return of the Prodigal Son"
I've been been touched the most by how our Father wants to place His hands on us in comfort, not just have us be 'looking-on' as the Elder son, depicted in this marvelous compassionate painting above by Rembrandt (currently graces a wall at the Hermitage, St. Petersburg)! The question that has been haunting my thinking is who am I in this story? For so long I thought I was the 'younger son,' but recently I've been gaining a new perspective... seeing myself more as the "elder son." While Nouwen's description of his life does not fully parallel mine, there are many aspects of his story that cause me to reflect... Do these quotes from "the Return of the Prodigal Son" speak to you? Pause and ask yourself, "who am I in this rich story?" [Nouwen...] "...I am, indeed, the eldest child in my own family, ...[I've come] to see how I had lived a quite dutiful life. When I was six years old, I already wanted to become a priest and never changed my mind. I was born, baptized, confirmed, and ordained into the same church and had always been obedient to my parents, my teachers, my bishops, and my God. I had never turned away from home, never wasted my time and money on sensual pursuits, and had never gotten lost in "debauchery and drunkenness." For my entire life I had been quite responsible, traditional and home-bound. But, with all of that, I may in fact, have been just as lost as the younger son. I suddenly saw myself in a completely new way. I saw my jealousy, my anger, my touchiness, doggedness and sullenness, and, most of all, my subtle self-righteousness. I saw how much of a complainer I was and how much of my thinking and feeling was ridden with resentment. For a time it became impossible to see how I could ever have thought myself as the younger son. I was the elder son for sure, but just as lost as his younger brother, even though I had stayed "home" all my life." "I had been working very hard on my father's farm, but had never fully tasted the joy of being at home. Instead of being grateful for all the privileges I had received, I had become a very resentful person: jealous of my younger brothers and sisters who had taken so many risks, and were so warmly welcomed back...."
"For hours I looked at the splendid drawings and paintings he [Rembrandt] created in the midst of all his setbacks, disillusionment, and grief, and I came to understand how from his brush there emerged the figure of a nearly blind old man holding his son in a gesture of all-forgiving compassion. One must have died many deaths and cried many tears to have painted a portrait of God in such humility." The questions I've come to ask myself include: am I looking-on beholding the embrace and yet not feeling the hands; am I viewing at a distance and not feeling the warmth of the embrace; have I tried so hard and missed the full experience of acceptance within the arms of my Father? Our life is not meant to be lived out as a spectator. Our lives are meant to be full of the experience of unconditional love and acceptance... practically it can only come about through the relationship with the most remarkable "Father!"